A deal has been reached to settle the long-running dispute at Royal Mail over pay and working practices which led to nationwide strikes last year. Staff will receive a 6.9% pay rise over three years and full-time workers will get extra payments worth up to £1,400 when all agreed changes have been made. In exchange, the union representing postal workers has agreed to the use of new machinery and working patterns. Royal Mail said it could now "get on with its modernisation". Members of the Communication Workers Union (CWU) will now be balloted on the agreement. The deal follows lengthy discussions between Royal Mail and the CWU. "It's been a long time coming, but this deal delivers on the major issues which postal workers have fought for," said David Ward, CWU deputy general secretary. 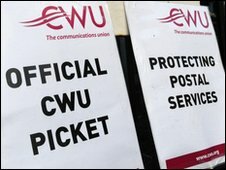 Postal workers will receive a 2% pay increase this year, followed by a 1.4% pay rise in 2011 and a 3.5% rise in 2012. They will also work shorter hours - down from 40 to 39 hours a week - and the Royal Mail has agreed to keep 75% of the workforce as full-time, rather than part-time staff. A bonus of £400 will be paid to full-time workers following the agreement of union members and a further £1,000 will be paid once the planned changes are implemented. In exchange, the union has accepted the large-scale modernisation plan that the Royal Mail says is crucial for its future. The plan includes the introduction of new automated machinery in mail centres which sorts mail to the sequence it will be delivered on a postman or woman's delivery round. As a result, postmen and women will spend more time out on deliveries. But the BBC's business correspondent John Moylan said that the introduction of the new sorting machines is likely to lead to significant job cuts. New delivery equipment, such as electric trolleys and vans, will also be used, and restrictions on the amount of junk mail delivered by Royal Mail will be lifted. This will allow the company to increase its share of the "unaddressed Door to Door" market, which currently stands at 25%. The CWU said the deal represented a good deal for its members, particularly in the current financial climate. "Many workers - particularly in the public sector - are facing pay freezes, compulsory redundancies and even, in the case of Unite members at British Airways, the prospect of pay cuts," it said. "We feel that the proposed deal for our Royal Mail members compares extremely well." Royal Mail has consistently argued that changes were vital as its core business of delivering letters and parcels is declining by 10% every year. The group also has a £6.8bn pensions deficit. "This is crucially important in allowing Royal Mail to compete successfully in the highly competitive communications market and to help counter the effect of the ongoing decline in traditional mail volumes," said Mark Higson, managing director of Royal Mail Letters. "It enables the business to rapidly complete the introduction of the latest-generation sorting technology and new delivery methods to improve efficiency." Concerns over job losses have been at the heart of the dispute, which resulted in the union calling nationwide industrial action last year. While the union agreed cuts were necessary for Royal Mail to modernise, it claimed the company had not been open enough about the nature of those changes. Gregor Gall, Professor of Industrial Relations at the University of Hertfordshire, told the BBC that he would expect union members to vote in favour of the latest agreement. "They are getting some money up front while they have also got some control over the process of change," he said. However he added that changes could still face some opposition when they are implemented at a local level.